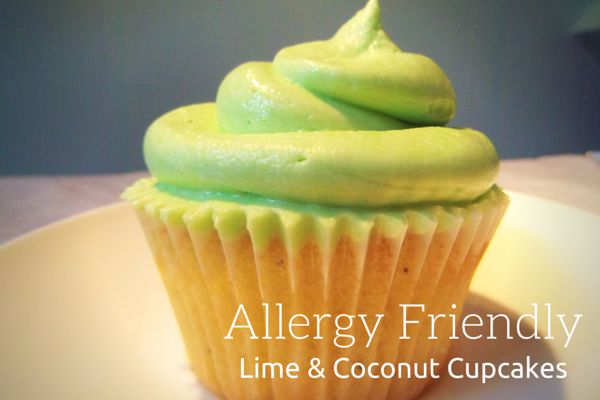 I have been on the hunt for a springy, tasty cupcake recipe ever since we switched our youngest to a gluten free diet a few months ago after already being dairy and soya free. Having to omit butter and wheat flour (the main staples of a cake recipe) made everything I baked either very dry and crumbly, or extremely wet after an hour or two and either way, everything had a grainy, dusty after texture. All the recipes seem overly complicated too, adding random ingredients which to me seemed unnecessary. So after a little bit of playing and going back to the basics of cake baking ratios of 2:2:2:1 I learnt as a child (2oz each of butter, sugar, flour to every egg used) I think I have created a gluten free, dairy free and soya free cupcake that is light and springy and holds just like a wheat flour cupcake. I have also been desperate to find a dairy free frosting that doesn’t split and go oily and can hold up to piping without collapsing into a soggy mess. I have tried numerous methods, both from following recipes as well as from experimenting but nothing really looked or tasted how I wanted. Until now!